The gardening season is almost here and if you have a garden, you are probably starting to plan what to plant this year. We thought it would be great to write now an article about companion plants, so that you consider this in your planning. This can have many advantages as you will see. 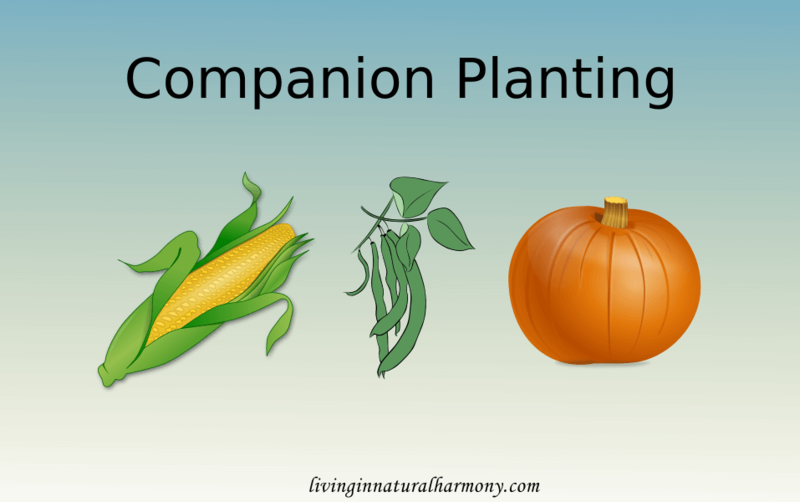 Companion planting can be used in home gardens as well as in agriculture. There are many books about plants that go well together. Much of these information go back to traditions and testimonials, but some were also generated by scientific studies. In this post, I am highlighting the method of combining different crops from a scientific perspective, providing you with practical information you can use for your own garden. While different crops have also different characteristics, they are all plants and thus share some basic properties. They all need light, water and nutrients. Therefore, they also compete with each other for their resources. But besides competition, some associations of crops can entail certain benefits. The example probably best studied scientifically is the effect of Marigolds (Tagetes spp.) on nematodes. Nematodes are tiny little worms that live in the soil and many attack our crops. They can feed on a variety of plants, which makes it more difficult to get rid of them. But it turns out Marigolds can suppress certain nematode pests by producing nematode toxins and stimulating natural enemies . So, if you have a problem with nematodes in your garden you could try planting Marigolds. Apart from these tiny worm, many pests causing troubles with our food production are insects. The family of Brassicaceae, which includes many vegetables, like cabbage, cauliflower, Brussels sprouts and kale, are particularly vulnerable to certain pests and hence their control is important. Fortunately, a series of other plants have been reported to decrease the pest problem for certain Brassica crops. A study from 2014 on companion planting showed that garlic (allium sativum) as well as onion (allium cepa) reduced pest prevalence in cabbage significantly, while increasing yield . Another study found that onion, garlic and coriander protect mustard from pests when planted together, reducing the pest population in comparison with the sole crop . For cauliflower, a recent study showed that intercropping with coriander attracted natural enemies of cauliflower pests and increased yield, comparing to a planting of cauliflower only . 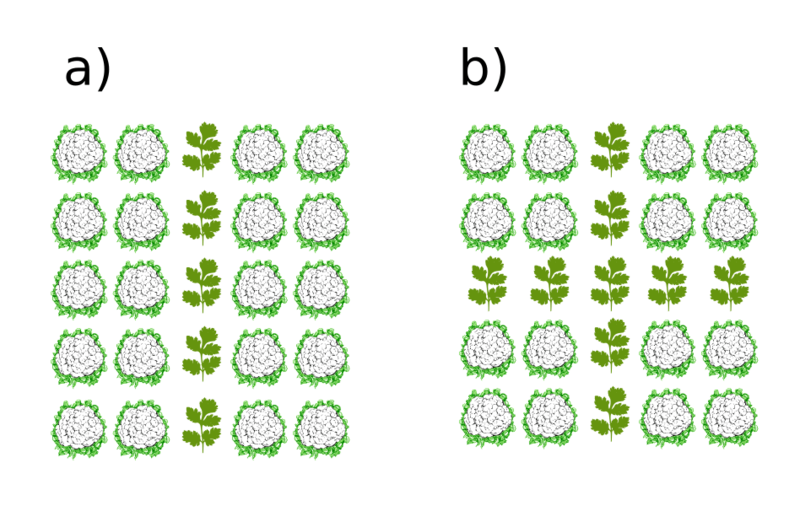 This study also tested different ways of planting the two plants: in lines or in squares. They found the coriander-cauliflower planting in squares decreased pest population more than the arrangement in lines. But not only Brassicas profit from companion planting. Lettuce for example can also be protected from certain caterpillars with onions . Another source of pest are of microbial origin, attacking from the soil or through the air. One such pathogen is the fungus Verticillium causing wilting in range of crop plants, including tomato, potato and eggplant. In a companion planting study with an onion type and tomato, researchers found that disease incidence as well as symptoms of Verticillium were reduced in the intercropping compared to the monocropping . And this effect seemed related to an stronger activation of defense genes in tomato plants growing together with onions. A very traditional system of companion planting is the milpa or the three sisters. In this approach, maize (corn), beans and squash (or pumpkin) are grown together. The maize stalks serve as poles where the beans can climb and the squash shades the soil, minimizing evaporation and suppressing other plants. The beans as a legume also has the ability to fix nitrogen from the atmosphere, adding an auto-fertilizing effect to this system. Some of this fixed nitrogen can be transferred to the maize by the help of mycorrhiza. This milpa system can overyield, which means it can produce more food on a given area than growing single crops . In animal food production intercropping is common as well. For a mixture of grass and clover a proportion of 40-60% clover has proven to produce maximal yields . In this case clover will not be able to get a lot of the nitrogen in the soil, due to competition with the grass. Resulting in an increased fixation of nitrogen from the air. Unsurprisingly therefore, in mixtures with barley and legumes, overyielding has been shown . Furthermore, compared to sole cropping, intercropping with grass and legumes, diseases were reduced in the range of 20-40%. Besides using combinations of legumes and grass plants, you can also increase productivity in your own garden by choosing plants with different ripening times. For example you could plant rows of lettuce in-between rows of carrots. The carrot plant in its early stage is quite upright and struggles at shading out any weeds. There the broad leaved lettuce comes in handy, suppressing other unwanted plants. Since lettuce grows fast, by the time the carrots need more space, the lettuce can be harvested. As you can see, companion planting or intercropping have many benefits and can help to farm or garden in more sustainable ways. The cultivated varieties (cultivars) used were often optimized for sole cropping, nevertheless beneficial effects can be observed in mixtures with other crops. In the future, cultivars may be developed that are adapted to work optimally with companions, which may further improve their beneficial effects. Have you had some experiences with combining different plants in your garden? Let us know in the comments below! Hooks, C. R., Wang, K. H., Ploeg, A., & McSorley, R. (2010). Using marigold (Tagetes spp.) as a cover crop to protect crops from plant-parasitic nematodes. Applied Soil Ecology, 46(3), 307-320. Debra, K. R., & Misheck, D. (2014). Onion (Allium cepa) and garlic (Allium sativum) as pest control intercrops in cabbage based intercrop systems in Zimbabwe. IOSR Journal of Agriculture and Veterinary Science, 7(2), 13-7. Afrin, S., Latif, A., Banu, N. M. A., Kabir, M. M. M., Haque, S. S., Ahmed, M. E., … & Ali, M. P. (2017). Intercropping Empower Reduces Insect Pests and Increases Biodiversity in Agro-Ecosystem. Agricultural Sciences, 8(10), 1120. Mahendran, B., Sharma, R. K., & Sinha, S. R. (2018). Strategies for Insect Management in Cauliflower (Brassica oleraceae var. botrytis) Through Habitat Intervention. Proceedings of the National Academy of Sciences, India Section B: Biological Sciences, 88(1), 305-311. Sulvai, F., Chaúque, B. J. M., & Macuvele, D. L. P. (2016). Intercropping of lettuce and onion controls caterpillar thread, Agrotis ípsilon major insect pest of lettuce. Chemical and Biological Technologies in Agriculture, 3(1), 28. Fu, X., Wu, X., Zhou, X., Liu, S., Shen, Y., & Wu, F. (2015). Companion cropping with potato onion enhances the disease resistance of tomato against Verticillium dahliae. Frontiers in plant science, 6, 726. Nyfeler, D., Huguenin-Elie, O., Suter, M., Frossard, E., & Lüscher, A. (2011). Grass–legume mixtures can yield more nitrogen than legume pure stands due to mutual stimulation of nitrogen uptake from symbiotic and non-symbiotic sources. Agriculture, ecosystems & environment, 140(1-2), 155-163. Hauggaard-Nielsen, H., Jørnsgaard, B., Kinane, J., & Jensen, E. S. (2008). Grain legume–cereal intercropping: The practical application of diversity, competition and facilitation in arable and organic cropping systems. Renewable Agriculture and Food Systems, 23(1), 3-12.